Dry Block Low temperature calibrators. T-25N Low temperature Dry Block calibrator. Temperature from -25°C to 125°C . T-35N Low temperatur Dry Block calibrator. Temperature from -35°C to 125°C. T-50N Negative temperature Dry Block Calibrator. Temperature from -55°C to 125°C. T-25N T-25N Dry Block Calibrator. Temperature from -25°C. T-35N T-35N Dry Block Calibrator. Temperature from -35°C. 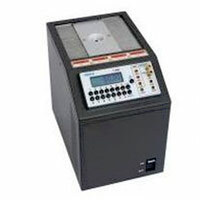 T-50N T-50N Dry Block Calibrator. Temperature from -50°C. Accomplish completely automatic calibrations with or without the use of a computer. Documenting capabilities: communication with computer and CS-504 Calibration Software. Portable, compact, provide interchangeable inserts and carrying case. such as Super Thermometer ST-501. T-25N, T-35N and T-50N 0.01°C. T-25N, T-35N and T50N ±0.02°C through temperature range. Presents input for thermocouples, thermo resistance and thermo switches. Besides generating temperature, they measure the signal from the sensor being calibrated. Perform TC readings with high precision internal cold junction compensation.